Brushing done around a newly planted cutblock. An integral part of forest management is ensuring that harvested areas re-grow healthy, vigorous stands of young trees to form the next forest generation. This practice is called Silviculture, which in essence means the growing of trees. 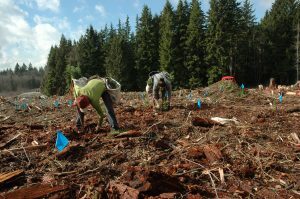 Silviculture begins before harvest, with a detailed ecological assessment. A silviculture prescription is designed, including measures to protect soil, water, wildlife, views, and other values. Detailed plans are made for reforestation and growth of the future forest. Following harvest, the next step is preparing a site for planting. We keep site preparation to a minimum to avoid unduly impacting the site; however, sometimes it is necessary to pile and burn debris to open new areas for planting. We broadcast burn rarely, and always in conjunction with research and training. Our cutblocks are planted the year following harvesting, usually with Douglas-fir and western redcedar at densities averaging 1,800 trees per hectare and sometimes higher. Red alder, white pine, grand fir, amabilis fir, and yellow cedar may also be planted. Other species such as western hemlock, birch, maple and cottonwood seed in naturally from the surrounding forests. Our planted seedlings are grown at various nurseries throughout coastal British Columbia , and when available from seeds collected periodically from the Research Forest. Tree planting is done every year. After planting, seedlings usually experience tough competition for light and space from the many herbaceous plants and deciduous trees that form part of our lush coastal forests. 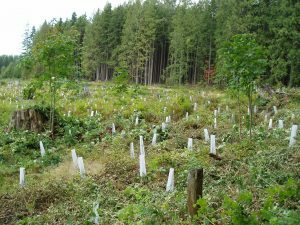 Part of the reason for planting at high densities is to ensure that an adequate number of desired species become part of the next forested stand. Growth of the young seedlings is encouraged by periodic manual brushing around each seedling. Where seedlings are not growing, we leave the other herbaceous plants or deciduous trees to grow. These species form an important part of the site’s biodiversity and are a vital source of food for animals browsing in the cutblocks. For more information on our Silviculture programs, please contact Cheryl Power.